Jl. Solo Yogya KM.26 Penggung, Ceper, Klaten 57465, Central Java, Indonesia. To learn more about Indonesia, please visit: http://indonesia.travel/en/discover-indonesia, it is a government portal of Indonesia. In case you need to apply for a visa from your home country, please check with the Indonesian embassy or nearest consulate office for information how to apply. In case you need an invitation or sponsor, please contact us. The climate of Indonesia is almost entirely tropical. The uniformly warm waters that make up 81 % of Indonesia’s area ensure that temperatures on land remain fairly constant, with the coastal plains averaging 28°C, the inland and mountain areas averaging 26°C, and the higher mountain regions, 23°C. Temperature varies little from season to season, and Indonesia experiences relatively little change in the length of daylight hours from one season to the next; the difference between the longest day and the shortest day of the year is only forty-eight minutes. The main variable of Indonesia’s climate is not temperature or air pressure, but rainfall. The area’s relative humidity ranges between 70 and 90%. Winds are moderate and generally predictable, with monsoons usually blowing in from the south and east in June through September and from the northwest in December through March. Practically, June to October is a dry season and temperature may rise up to 38°C during this time. October to March is rainy season and temperature remains between around 26°C and 30°C. Generally, there is no winter in Indonesia. In addition to hundreds of ordinary hotels, there are several 3*/4* hotels in Solo City. Novotel, Ibis, and Best Western are pretty good hotels in the city center and Lor Inn and The Sunan at a little distance. Taxis are available 24 hours. If you come from Jakarta, you can take a domestic flight to Solo City (SOC), that will take 60 minutes. 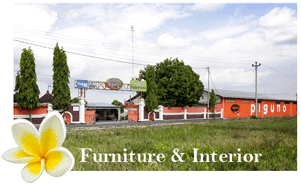 We can pick you up from airport to our Indonesia furniture manufacture, or you can take a taxi (from a counter suggested). It’s a 20 minutes’ drive to our factory. But there’s no flight from Bali (DPS) to Solo! If you come from Bali or elsewhere but through Yogyakarta (JOG), you can call us to pick you up, or take a taxi. It’s a 90 minute drive to Solo. Klaten, Jawa Tengah - Indonesia, Asia. Copyright 2019 © Piguno Furniture & Interior. All right reserved.